Black Ops 4 was one of the most anticipated games of 2018. During the beta phase gamers would submit feedback about the gameplay, glitches, map layout and so forth. However, when the game was released in November, many gamers experienced glitches in-game which effected their performance. A new issue was found, and it’s ridiculous. The r/Blackops4 is filled with loads of information, thoughts, feedback, news and the ever tasty highlight reels. If you’re not careful, you might fall into the quicksand of Reddit where you continue to read through post after post; similarity to YouTube scrolling. Well, one interesting post garnered a lot of attention. One user by the name of u/Geckom8 has submitted a video clip of him playing Black Ops 4. He also goes by the gamertag “Gecko M8”. In this clip below, Gecko M8 was playing on the Black Ops 4 map Contraband. He was specifically playing Team deathmatch where the score was pretty even. ** Must be logged into your Reddit account to see clip. If you don’t have a Reddit account, click title of link. At one point in the match, it seems like Gecko M8 was running around the map with his melee weapon, possibly to unlock a certain camo and complete challenges for his weapon. Gecko M8 had his melee weapon out and managed to kill someone with it; this is where the video clip starts. He was on the East side of the map where he spotted an enemy. Equipped with his melee weapon out, he started chasing the enemy down, trying to get his crosshairs on his target to enable the lock-on feature with his melee weapon. What that action typically does is lock onto your enemy, swinging you forward for the one-hit kill. However, something goes totally wrong. A bug in Black Ops 4? As Gecko M8 was approaching the enemy from behind, he had a clear line-of-sight. What’s odd is that he locks onto the enemy, thrusts forward and swings his weapon. The swing did not register so he doesn’t get a kill. He tries 4 more times without any luck. His weapon simply was not registering and the enemy turned around to kill him easily. The annoying part about this was with every swing makes a sound, so the enemy only turned around because he heard Gecko M8 swinging. As Gecko M8 said in his title, “I’ve played COD for over 8 years and never see anything like this…“. It seems like many gamers have also agreed that they’ve never seen a fail like this before in any video game. The post garnered 10,000+ upvotes, with 686 comments as of this writing. Black Ops 4 subreddit has over 280k subscribers, with an average of around 3.5k viewers online. If a gamer wants to get their message out (especially if it’s a valid one), this would be the best place to submit your question or complaint. 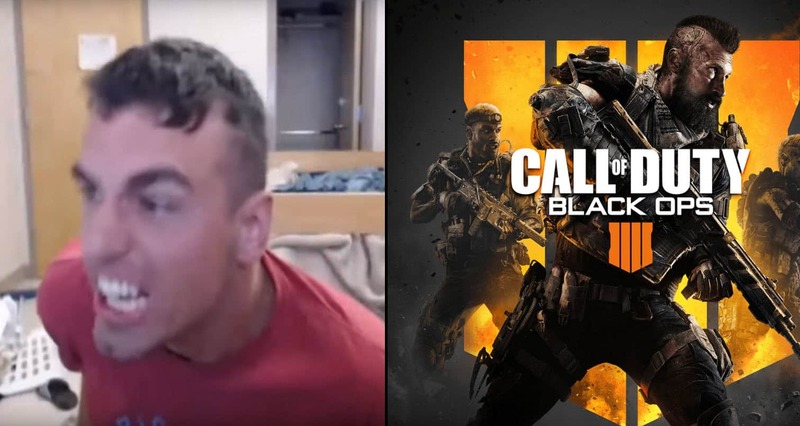 Luckily for geckom8, he was able to get a positive reaction from the Black Ops 4 community, boosting his post to the top of the page. Surely, someone from Treyarch, creators of the Black Ops franchise saw this horrible bug in the game. Comment from discussion choc415’s comment from discussion "I’ve played COD for over 8 years and never see anything like this…". This brought in 3.1k+ upvotes as of this writing, which many Call of duty players in the community agreeing that there’s just too many complaints about a new game that just came out 2 months ago. Will there be other glitches in the game that will be brought up by the community? We’re afraid so, and it seems to be a common theme at the subreddit of Black Ops 4.